Something from Nothing… DMT Related? This is the topic that makes concepts such as telepathy, telekinesis, and “Out of Body Experiences” look tame by comparison. This topic stretches the imagination of even the most weathered esoteric excavators. While we have no direct experience with the occurrence of the “materialization” of objects… this has been sporadically reported throughout history. Therefore… it is essentially mandatory that we speculate on some of the mechanisms of it’s transpirations. When we refer to “materializatons”, we are referring to the concept of objects appearing essentially out of thin air. For this to occur, we believe that it is likely not truly taking place “out of thin air”. Perhaps the building blocks of the object are not easily seen by the naked eye but that hardly equates to a lack of existence being that the human visual spectrum is relatively limited… especially in average states of consciousness. We presume that since a physical object seems to be occurring based on the “imagination” or “thought process” of a human, we must begin by identifying endogenously produced particles that can emanate outside of the body in order to form the object. Obviously this leaves the more commonly discussed layers of physiology such as chemicals, genes, enzymes, fluids, and flesh out of the discussion (for the most part). Instead the focus logically directs us towards the effects of magnetic fields, electromagnetic fields, electricity, and biophoton emanation all of which has been observed in one form or another within and surrounding human physiology. It’s been theorized that all matter (solid, liquid, gas, plasma) and objects are comprised of tiny particles known as atoms. 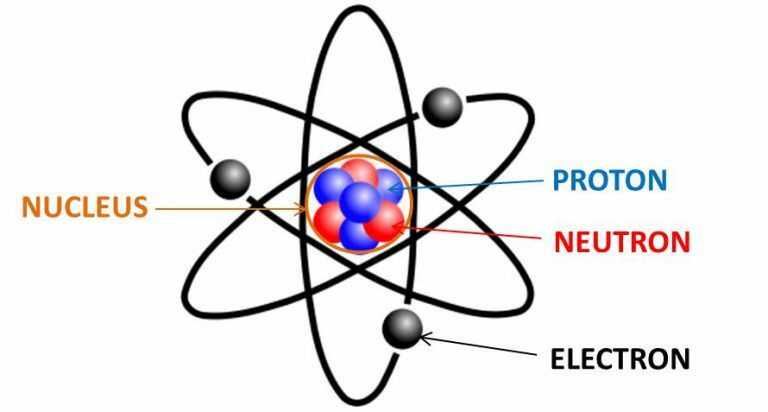 These atoms are comprised of a nucleus containing protons/neutrons and electrons bound to the nucleus. The number of protons/neutrons in the nucleus of the atom is called the “mass number” (example: oxygen has 8 protons and 8 neutrons in the nucleus equating to a mass number of 16). The number of protons dictate what is called the “atomic number” and indicates a chemical element (example: oxygen has 8 protons in the nucleus equating to an atomic number of 8). These chemical elements are organized by their atomic number in a format called the “periodic table”. When atoms form bonds with other atoms, a chemical bond is formed and new molecules are created. In the case of water, two hydrogen atoms bond with one oxygen atom creating one molecule of water. Just as an example of the number of atoms that create a liquid form of matter… a single drop of water (H2O) contains about 2 sextillion atoms of oxygen, and twice the number of hydrogen atoms. The density of matter is indicated by the concentration of atoms in relation to the mass of the matter in question. We provide this very brief background in order to give some perspective in regards to the building blocks of what we deem as “reality”. The interaction of atoms forming chemical bonds are the building blocks of every form of matter known to man. This is why it’s interesting to note that atoms are largely comprised of empty space. It’s been stated that the nucleus of an atom is about 100,000 times smaller than the atoms they’re housed in. A famous analogy to emphasize the empty space of atoms is the fact that if one were to take just the nucleus of all the atoms of every human in the world… it would would fit within the equivalent size of a sugar cube. Everything else is considered empty space. The logical question that follows is… why do objects feel so solid? Physicist and author of over 1,400 scientific papers, Dr. Robert Barlow would discuss this in the piece titled, “If Atoms are Mostly Empty Space, Why do Objects Look and Feel Solid?”. He states, “Many websites will tell you that this is due to the repulsion – that two negatively charged things must repel each other. But this is wrong, and shows you should never trust some things on the internet. It feels solid because of the dancing electrons. What does all this have to do with the topic of materialization? In order to even begin to discuss this strange phenomena, we needed to take a look at the building blocks of “matter” (solid, liquid, gas, plasma). We presume that materialization takes place in the form of cultivating particles of matter (atoms) in order to form objects. How this transpires is obviously one of the biggest mysteries in existence. In the piece “Biophotons and DMT”, we cited multiple studies indicating that the human body produces photons internally as well as emanating photons externally from the extremities. A photon is the smallest unit of physical measurement of the electromagnetic field. While photons are not considered to be particles of “matter” such as electrons, the possibility of manifesting electrons from photons was actualized in the 1990s. This breakdown of the vacuum by an ultrastrong electromagnetic field was hypothesized in 1950 by Dr. Julian S. Schwinger, who was awarded a Nobel Prize in Physics in 1965. The creation of matter by colliding photons of radiation is believed to take place in some stars, but it was never observed in laboratory experiments before, largely because the required energy is beyond the reach of conventional laboratory equipment. With his special theory of relativity, Einstein showed that matter and energy are equivalent and can be transmuted through the equation E=mc2 ; that is, energy in ergs is equal to mass in grams times the speed of light squared, in centimeters per second. This accounts for the vast energy released by small amounts of matter in nuclear explosions, but it also means that staggering amounts of energy are required to create even the tiniest particles of matter. Obviously there are many, many missing pieces to the equation of "materialization” from photonic emanation based on altered states of consciousness. While particles of matter such electrons/positrons have been observed to be created from photons when utilizing artificial radiation… there still lies the question of the nucleus of the atom, the organization of atoms into molecules, and the organization of molecules into objects. Much like in the description of the 1997 study where the collision of the photons created an enormous electromagnetic field… we believe that in severely altered states of consciousness, the human brain/body is capable of generating electromagnetic fields that emanate outside of the physical body. From a chemical perspective, we do believe that there is a synchronous, measurable neural-based upregulation of the “endohuasca” system coinciding with this field expansion. The size of the field would coincide with the increased amplitude strength of slow wave/fast waves. For instance, in the piece “Telekinesis, DMT & a Huge Gamma Spike”, it was observed the the subject effectively moved a small object telekinetically when his brain exuded enormous amplitudes in theta waves (slow) as well as extremely fast gamma waves (400Hz). We speculate that in the case of materialization, the activity might even be more pronounced with significant amplitude in the delta/theta ranges as well as the potentiality of gamma waves of 1000 Hz or more. This would lead to an even stronger electromagnetic field emanating from the human during these moments. We refer back to the direct current (DC) measurement utilized by Dr. Robert O. Becker to measure changes in brain activity. Instead of EEG equipment, Becker found that DC measurement allowed for cleaner signaling to discern different states of consciousness. He outlines this in his book “The Body Electric”. As we’ve cited incessantly at Q4LT, Becker found that changes in the direction of the DC current occur with changes in states of consciousness. When a person is awake and alert, the frontal potential of the brain is negative while the back is positive. When a person is asleep, the direction reverses and the frontal potential of the brain is positive while the back is negative. In significantly altered states of consciousness such as hypnosis, meditation, rhythmic breathing exercises, etc., it’s been observed that slow wave amplitude increases (theta/delta) simultaneously with fast wave spikes (gamma). This alludes to the notion that instead of a clear direction of the current occurring… it is now a strong, very rapid alternating current that is taking place. It appears as though this rapidly alternating current could induce a powerful collision of photons and electrons in the brain region somewhat emulating that of a particle accelerator. However, there are other missing pieces to the equation such as the absence of a vacuum based on normal atmospheric pressure. There are theories that extreme changes in neural fluid dynamics of cerebrospinal fluid can possibly create small, split second vacuums within the brain. Interestingly enough, Dr. Walter J. Freeman (RIP) described the occurrence of pulsing/rotating patterns of intracranial electroencephalography (ECoG) amplitude on the surface of the brain resembling satellite images of the vortex of a hurricane. We irresponsibly and recklessly speculate that these vortices can materialize outside of the body when a person’s field is expanded and that these vortices carry the information to organize structures. We presume that there are underlying mathematical equations coinciding with all atomic formation, connectivity/reactivity and that this equation might be carried over the waves generated by human intent. Unfortunately we’ve now speculated more than we hoped for on a speculative topic so we shall leave further speculations alone for now. While materialization has been reported throughout ancient history (especially in religious texts), we will focus on more contemporary researchers (somewhat) in terms of our source material. The first subject was a french physiologist named Dr. Charles Richet. In 1887, Richet became professor of physiology at the Collège de France investigating a variety of subjects such as neurochemistry, digestion, and breathing. In 1913, he would go on to win the Nobel Prize in Physiology/Medicine due to his research on a condition known as “anaphylaxis”. Throughout this time, Richet would also gain interest in the field of parapsychology and the study of psychic mediums. In 1894, Richet would coin the term “ectoplasm” to describe a substance that emanated from psychic mediums when in a trance state. Here is a description of ectoplasm by one of Richet’s colleagues who studied the phenomena: “very variable in appearance, being sometimes vaporous, sometimes a plastic paste, sometimes a bundle of fine threads, or a membrane with swellings or fringes, or a fine fabric-like tissue”. In some cases, limbs and greater portions of a body would materialize from the ectoplasm of mediums. Interestingly enough, it’s been reported that low light conditions are necessary for the manifestation of ectoplasm. This resonates based on the marked effects of light/darkness on the brainwave activity of humans. Jumping timelines to more recent times, philosopher and researcher Dr. Stephen Braude has studied various topics related to the “supernormal”. One of his most profound case studies revolved around a woman known as “The Gold Leaf Lady”. This case took place in the 1980s and encompasses a woman who emanated what appeared to be large pieces of gold-like sheets from various parts of her body. Braude would utilize the services of magicians to verify that the woman was not utilizing any trickery to manifest the substance. In order to verify the composition of the metal, Braude would have it tested at multiple universities including the University of Baltimore Maryland, University of Denver, and Johns Hopkins University. They would all conclude that the substance emanating from the woman was brass (a combination of copper and zinc). Based on the amount of material emanated from the body, it was concluded that secretions of copper and zinc would be completely insufficient to explain the manifestation. It’s interesting to note that while “The Gold Leaf Lady” was not a professional psychic, other “paranormal” phenomena was reported alongside the manifestation of the brass sheets. She reportedly assisted local law enforcement in solving crimes (via psychic ability), induced rapid seed germination in her hands, showcased the ability to bend metal, and although illiterate was observed writing quatrains in medieval French during her mediumistic moments. In 1996, Dr. Stanley Krippner would publish a case study in the Journal of Scientific Exploration regarding the materialization of objects from a Brazilian man in his 50’s named Amyr Amiden. Amiden was of Syrian descent and had been raised Muslim but had developed an openness to inspiration from all religions. In this case study, Krippner and his team of researchers would document the occurrence of materialization alongside changes in the subject’s pulse, blood pressure, and saliva pH. According to Amiden, he rarely exuded volitional control over the phenomena but he did believe there were internal signals that indicated “something” was happening. He would experience a taste of acid in his saliva, the loss of color vision, and the appearance of sweat on his hands. According to Krippner and his team, Amiden would materialize objects such as polished stones, rings, and jewelry… sometimes in the near vicinity and sometimes in other rooms within the building of the experiment. 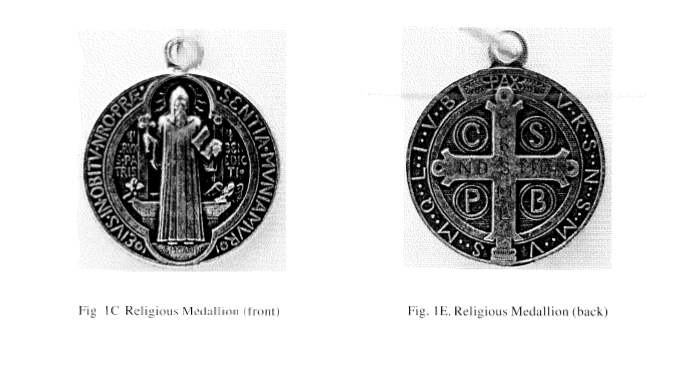 Ectoplasm, brass sheets materializing from the body… medallions appearing out of “thin air”? While these occurrences (as well as everything cited at Q4LT since inception) stretch the mind as far as the mind can stretch… it might indicate that the general modern perspective of “consensus reality” might possibly need some significant adjustments. Some rules might be getting bent… some might be getting broken… and others are most likely getting shattered. We must remain malleable in our beliefs based on the integration of information that we were once ignorant of. There are certain “explanations” that will attempt to be interjected into the conversation such as “ectoplasm” being nothing more than trickery using cheese cloth, brass foil carefully manipulated by the subject, and outright fabrication by Krippner’s team of Amiden’s materializations. The problem with these types of “explanations” is that they are not critical by nature and dismiss the integrity and intelligence of the researchers outright. This is an unnecessary and silly reflex from humans who experience their belief system being challenged. A more “progressive” explanation might even include the notion of mass hypnosis (although in the case of “The Gold Leaf Lady”, the direct results of materialization was caught on camera). The mass hypnosis explanation is still interesting in the sense that there would most likely be a synchronization of brain activity amongst all parties in the vicinity coinciding with the perceptual effects of interacting with materialized objects. However, capture devices such as cameras haven’t been verified to fall prey to hypnotic induction so there’s that. At this point Q4LT’s perspective is that during our altered states of consciousness, our photonic emanation potential is significantly different than during normal consciousness allowing us to possibly materialize our subconscious/superconscious imagination. The extensive multi-layered mechanisms with which this transpires is possibly one of the most challenging puzzles to solve for the next 100 years. However, the inability to thoroughly theorize the mechanisms of a phenomena does not equate to the lack of occurrence of said phenomena. The famous Weizzman experiment in 1998 showcased the strange nature of the “observer effect” in which beams of electrons changed when under observation. When observed by a person, electrons behaved like particles and when not observed, electrons behaved like waves meaning that the mere act of observation affected the experimental findings. This leads us back to the question we postulated in the piece “DMT Hallucinations or Expansion of the Visual Spectrum”… is our visual system based on ingesting reality or is our vision based on projecting reality? Or could it be a combination of both? There are other strange cases of paranormal activity that have been documented in one form or another. One of the strangest we’ve come across was documented in a book by Dr. Jeffrey Mishlove called, “The PK Man: A True Story of Mind Over Matter”. In this book, Mishlove presents data indicating that the “PK Man” seemingly had the ability to influence weather patterns and other inconceivable happenings. It’s interesting to note that the “PK Man” would utilize self-hypnotic techniques to achieve these unthinkable feats. Another strange case documented mainly through video was of a man named John Chang who is a reported Qigong practitioner. In one of the video’s of Chang, it shows researchers being shocked by his touch and the seeming ability of Chang to ignite a crumpled up newspaper on fire based on his intent. In the video below, it shows Mr. Chang apparently pushing a chopstick through a table. Whether these transpirations are in fact legitimate feats caught on camera is another discussion altogether… but they are quite entertaining! Q4LT’s general perspective of materialization is that it appears to be a definitive rarity in all things “supernormal”. While concepts such as “Out of Body Experiences”, “hands on healing”, and even telepathy have been reported quite consistently in modern times… concepts such as ectoplasm are much less commonly reported. However, we must remain cognizant that the popularity of a concept has no bearing on the actuality of it’s happening. In conversing with subjects who have had direct experience with these “materialization” of sorts, it appears as though it boils down to inducing and maintaining significantly altered states. Simply from an anecdotal perspective, subjects who have extensive experiences in the seance environment describe the initial formation of “ectoplasm” as a mist in the air. As the seance continues, the mist continues to get thicker and thicker. Whether this change in environmental perception coincides with a change in temperature or increasing humidity is difficult to discern. There are also cases of the physical, conscious transference of ectoplasm from the actively dying to the living. This is a first-hand recollection from my significant other’s family whose grandmother was a life-long “psychic healer”. While on her death bed, the grandmother motioned over to one of her daughters to come close to her as she emanated a white, semi-translucent substance from her mouth and then instructed the daughter to ingest the substance. Yes… we know… this is wild, wild stuff! We’re not claiming that the mechanisms for materialization are easily attained or replicated. We’re merely providing various sources for what we believe to be very strange and very rare phenomena. In order to better understand these incidents it might behoove us to take into consideration multiple theories regarding the universe. While modern cosmology and astrophysics seem adverse to entertaining the notion of these manifestations… alternate theories such as plasma cosmology and the electric universe theory appear to be open to integrating the “paranormal” into their models. While we don’t necessarily agree with Charles Richet’s perspective of the “supernormal” activity having no relation to the “spirit realm” or “afterlife”, we do agree with the notion that we must keep the discussion as simple as possible in order to understand it better. If you enjoyed the research that went into compiling this article you can tip us at our Patreon page. Thanks in advance for the contribution!